Ever heard of feverfew? It’s an herb with remarkable anti-inflammatory properties. In ancient times, feverfew was used to treat a variety of conditions including headaches and, as the name suggests, fever. Today, this natural medicine has been known to cure much more than a common headache and fever. Native to central and southern Europe, feverfew grows well throughout the U.S. They are small, white, daisy-like flowers with bright yellow centers. The flowers are actually a species of chrysanthemum. But feverfew is more than just pretty. In fact, it’s main active compound, parthenolide, gets its name from the ancient Greeks. Apparently, feverfew was used to save someone who had fallen from the Parthenon during its construction in the 5th century. Since that time, people have been using it medicinally for centuries. The most common use for feverfew today is for combating migraines and headaches. Experts believe that feverfew has painkilling and anti-inflammatory properties. Apparently, it reduces the release of the inflammatory substance, serotonin, from blood cells. It also slows down the production of a chemical transmitter, histamine. Both serotonin and histamine play a large role in migraines. Several human studies suggest that feverfew works well to combat migraine pain. One study had migraine-sufferers combine feverfew and ginger, then place it under the tongue. Prior to the study, participants suffered an average of two to six migraines per month. They found that the combination of feverfew and ginger taken before a migraine was about to occur lessened the severity of it. It also seemed to decrease pain two hours after treatment. Feverfew treatment was more effective at suppressing “pulsating” and “nausea” at the onset of the migraine for more than two hours. In addition, it was more effective than a placebo at reducing sensitivity to light and sound. Research reported by the University of Maryland suggests that taking dried feverfew daily may reduce migraines in chronic sufferers. Researchers surveyed 270 people who suffered from chronic migraines. 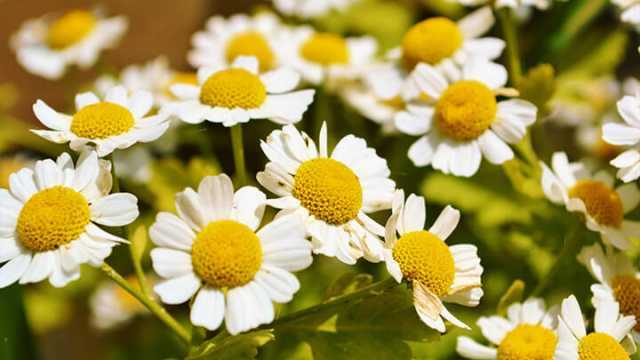 More than 70 percent felt significantly better after taking two to three fresh feverfew leaves daily. For migraine headaches, studies used 50 to 100 milligrams daily. Some studies suggest that feverfew may help reduce damaged skin cells and inflammation. Other studies show that feverfew may help relieve eczema, dermatitis and improve the appearance of the skin. It’s activity, according to DermNet, may be comparable to using weak topical steroids. Feverfew contains numerous biologically active components that have beneficial anti-inflammatory and antioxidant activity. It appears to inhibit a number of pro-inflammatory cytokines (proteins that interact with cells). Feverfew also impairs prostaglandin production as well as the action of neutrophils. These two actions help reduce inflammation and are helpful for inflammatory and autoimmune conditions. Pain during your period happens when the uterine lining produces too much prostaglandin, a pain and inflammation causing hormone. Because feverfew reduces prostaglandin production, it may be helpful in easing menstrual cramps. Researchers require more research. However, there’s no harm in taking feverfew a day before menstruation and cramping begins, suggests herbwisdom.com. Feverfew may also be helpful for lowering blood pressure. Apparently, when researchers studied the effectiveness of feverfew on migraines, they noticed how it also worked to lower blood pressure. This likely happens because of its ability to limit prostaglandins, which cause inflammation in blood vessels, suggests Neuropathy Treatment Group. Feverfew reduces pain and inflammation throughout the entire body. It does this by preventing the release of inflammatory substances such as serotonin, according to Neuropathy Treatment Group. Feverfew relieves pain similarly to pharmaceutical pain relievers or fever-reducing meds. But, unlike these over the counter pain relievers, feverfew has no lasting side effects. Feverfew may be useful for relieving pain and inflammation often associated with arthritis. This is, once again, thanks to its ability to decrease the body’s production of prostaglandins. Prostaglandins take part in several of the body’s functions such as blood pressure, blood vessel tone, inflammation and temperature. Researchers believe that compounds in feverfew decrease materials that initiate and lengthen inflammation. Inflammation, the body’s reaction to discomfort, injury or disease creates pain, redness and swelling where injury has accrued. And it may happen inside the body’s tissues and on the outside of the skin. Compounds in feverfew help prevent parts of the blood, known as platelets, from releasing inflammatory materials. Perhaps one of the most exciting aspects of feverfew is its ability to kill cancer cells. Or rather, its active compounds kill cancer cells. A few years ago, researchers discovered that it might be more successful for killing cancerous cells than expensive chemo drugs. Since then, the FDA has fast-tracked the plant’s compounds to be used in pharmaceutical meds, says the Natural Society. In fact, the flowers’s active compound parthenolide is so powerful, it’s been shown to outperform anti-leukemia chemo drugs. Research published by Pharmacognosy Review suggests that parthenolide displays anticancer activity against several human cancer cell lines. These cell lines include fibroblasts, laryngeal carcinoma, cells transformed with the simian virus, epidermoid cancer of the nasopharynx and anti-Epstein–Barr. For day-to-day medicinal use, feverfew products usually contain dried feverfew leaves. However, all parts of the plant that grow above ground can be used medicinally. Feverfew supplements are available fresh, freeze-dried or dried. They can be purchased as capsules, tablets or liquid extracts. Hey Buddy!, I found this information for you: "7 Benefits of Feverfew You May Not Know About". Here is the website link: https://www.thealternativedaily.com/benefits-of-feverfew/. Thank you.